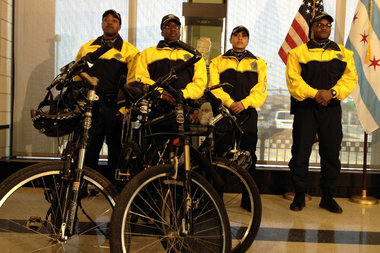 Mayor Rahm Emanuel proposes increased funding to train cops on bikes. CITY HALL — The mayor plans to put more cops on bikes and make the police force more mobile as he set Wednesday for the release of his 2015 budget proposal. Mayor Rahm Emanuel announced Monday that he'd be setting aside $2 million to double the number of police officers trained on bicycles in the coming year, as well as adding it to academy training of cadets. "This will take the number of officers trained on bikes from 200 to 400," said mayoral spokesman Adam Collins, adding that the $2 million will be spent on "bikes for the newly trained officers, replacement bikes for some current bike teams, other bike-team equipment and training to double the number of police officers trained on bikes in neighborhoods throughout the city." "Officers on bikes are more mobile and more approachable, helping fight crime and allowing for easy interactions and conversations with residents," according to a release Monday put out by the Mayor's Press Office. The expanded program builds on training initiated last spring to put officers on bikes in the 20 designated Operation Impact zones targeted to reduce crime and shootings on the West and South sides. "These teams have enjoyed overwhelmingly positive community feedback, helping build even stronger relationships between police officers and the communities they serve," according to the release. The mayor has scheduled his annual budget address for Wednesday at City Hall. The budget is also expected to add $2 million to afterschool and job programs for city youths. It will help provide a total of 24,000 jobs and 17,000 afterschool slots, up from 14,000 jobs and 13,000 afterschool slots in 2011.